The Reeves Vari-speed Motodrive is a mechanical variable speed drive unit consisting of motor, variable speed belt drive and gearbox where required. Speed variation is obtained by simultaneous adjustment of both driving and driven pulley diameters. The variable speed belt is wider than a standard vee belt, which allows for variation of pitch circle diameter (PCD) of the pulleys and thicker to withstand the lateral pressure which is applied to it. The variable speed belt and pulley drive is contained in a cast iron beltcase with shafts at fixed cantres. The casing has an inspection cover on each side. Shaft end covers have vents for belt, pulley and bearing ventilation. These are place in such a position to make the unit splash resistant. Driving and driven pulleys are constructed of separate pulley halves. 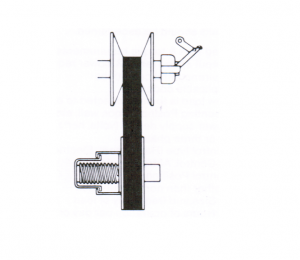 The driving pulley fixed half is mounted on the motor shaft whilst the other half slides on the fixed half and is controlled by a yoke through a screw and handwheel. 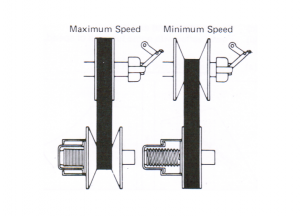 The driven pulley halves are mounted on the variable speed shaft, the fixed half is diagonally opposite the constant speed shaft fixed half to maintain the belt alignment. 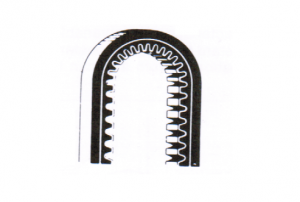 The sliding half is pressed against the belt by a helical compression spring. This means that the drive is correctly adjusted at all times and automatically compensates for wear. The heavy duty cog belt, specially manufactured for Reeves, is constructed from heat & oil resistant neoprene. The underside of the belt is notched to permit easier flexing around pulleys to increase the belt life.